The Electrifying Arm of the Law, E.S.C.O. Standing for Electro . Static. Civil. Officer., E.S.C.O. is the go-to in dealing with intense meta-situations as he is one of the few super-powered beings working within the law enforcement path. Billed as an advanced android provided by Asimov Technologies, E.S.C.O. is, in fact, a human named Armando Ruiz who is endowed with electrical powers that he uses to stun his opponents while a constant static pulse field around his body repels all metallic projectiles, making him effectively bulletproof. Armando's powers came about him at around puberty, when he accidentally caused a blackout during one of Chicago's heatwave attacks. Though powerful, Armando sought out a practical use for his powers. First, by self teaching himself and researching all aspects of electricity and magnetism at the library, as he couldn't use a computer without shorting it out. As he became a little more competent with his abilities, to the point of shielding himself in order to interact with technology, and was deciding on a college, he was approached by the Loman Organization to be utilized as a field agent. He spent much of college years as an Agent of Loman, until he stepped down and decided to use his abilities to serve the police force. Thanks to Loman, Armand was placed in Chicago's S.W.A.T. division and is the starting member of the Powers Division, a unit designated to respond and engage in super-powered crime and conflicts. With the starting of Frontline, E.S.C.O. serves as both a part-time member and as a liaison between the Chicago Police Force and the Superhuman Community. E.S.C.O. stills hides behind a mask to protect those he stands to lose most of all, his wife and newborn son. Abilities: E.S.C.O. possesses electromagnetic and eletrostatic abilities. 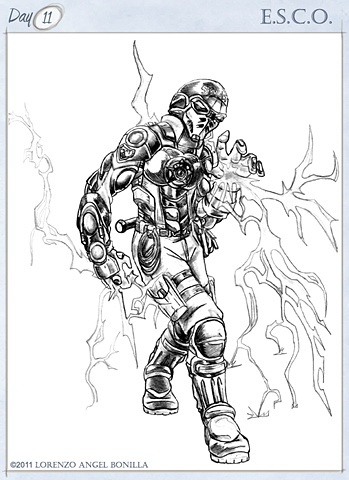 Capable of projecting bolts of electricity, yet possess little to no control in regards to aim; using "taser lines" housed in his gloves as focal tool in order to direct his charges. A constant electrical field around him nullifies most incoming projectiles, making him safe from bullets, knives, and metallic debris. However, energy projectiles and non-metallic objects can get past his field, while his field also disrupts most tech with his immediate vicinity. Able to make metallic objects "repel" or "attract" to one another by supercharging it with static energy. Uses this method to levitate and on a sack of ball bearings to cause confusion amongst enemies. E.S.C.O. 's armor is harder carbon plate armor with energy channeling discs to regulate Armando's energy flow with standard issue S.W.A.T. attire. His equipment consists of a bag of ball bearings, taser lines, metallic discs, plastic cuffs, carbon steel telescopic batons, mini antenna, and portable riot shield. Creation: E.S.C.O. is actually based on my best friend from High School, as this was his hip hop name he gave himself amongst his circle of friends and I used his middle name for the secret identity of the character. I wanted to employ as a character and juggled the idea around since college. He went through various revisions until I stuck with utilizing aspects of a police uniform for his character design, more specifically in the S.W.A.T. attire. The helmet came from S.W.A.T. Team helmets with a modified face mask, while I based a concept sketch of Havok from X-Men to tool around with the top, as a Special Weapons And Tactics officer would use a special kind of attire to make him stand out from you conventional S.W.A.T. wardrobe.